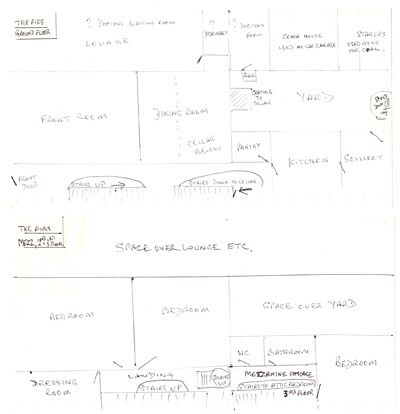 You are here: Home>Archive>Taylor Brown Collection.>Miscellaneous documents and objects.>Hand drawn plans of the Firs. Hand drawn plans of the Firs. Hand drawn plans of the layout of The Firs. 2 pieces of paper with hand drawn layouts of the Firs house. One sheet has the ground floor and the second has the mezzanine, 2nd and 3rd floors. Hand drawn in black ink on white ‘computer’ paper.